This past Wednesday I met Shirley for the walk up to the Guggenheim. Our destination was to see the Robert Motherwell collages and drawings which didn’t disappoint although a lot of the pieces do look better as photographs in the catalogue. Speaking of the catalogue – there were copies of it on all the seating areas in the galleries – I discovered a lot of interesting information about the materials used (in the 1940’s, 1950’s) and the fading of certain papers. A photo of the artwork was shown next to a digital “fix” of the colors which in a lot of cases they discovered under pieces that were coming unglued or that were protected in portfolios for decades. Fascinating. Leaving those galleries we dutifully walked up and then down the spiral to check out the More Important Artwork displayed. Bleh. Made no sense to me but it was a nice stroll, exercise even. Before we left the building we spent some time with Kandinsky. With our priorities in order Shirley and I headed to 3 Guys Diner (there are three of them spread up/down the avenue = 9 guys) on Madison for grilled swiss cheese and tomato sandwiches. Yum. We are totally lunch boring people. Walking down to the Met helped move the sandwiches on their way out of our stomachs. The main goal at the Met was to see “William Kentridge: The Refusal of Time” It is a 30-minute 5-channel video installation that is WONDERFUL and I plan I on sitting still and watching it again every time I return to the Met. Click on the link and read the description and know that what Mr. Kentridge created is beyond description and totally mesmerizing. It was brought to our attention that some of his prints were in another gallery so that’s where we went next. We are big fans. 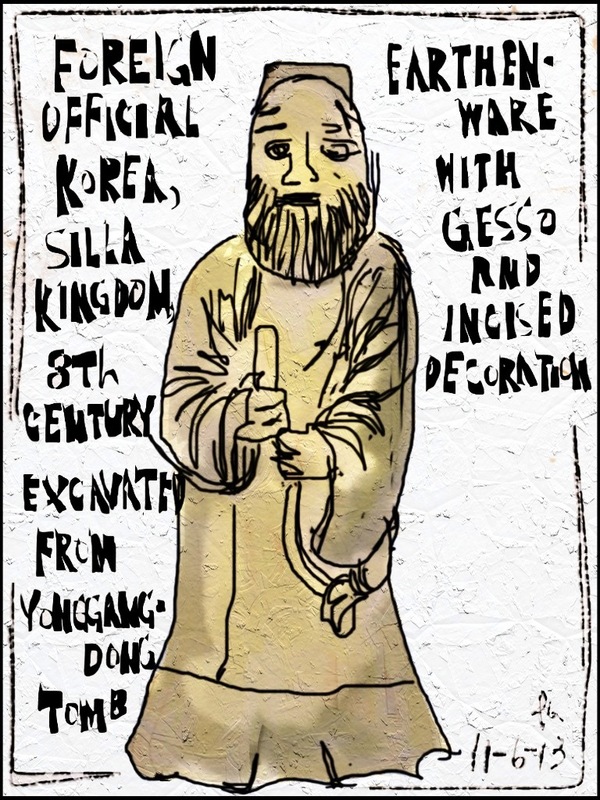 A new exhibition recently opened, “Silla: Korea’s Golden Kingdom”, and since we discovered, after walking the half mile through the Met’s hallways, that the contemporary Chinese something-or-other wasn’t opening until December, we headed there. We each went our own ways through the galleries but, independently, found ourselves sketching the same small, ancient, earthenware statue. Suffering from over-exposure to too much good stuff, including grilled cheese, it was time to part ways. Yay! 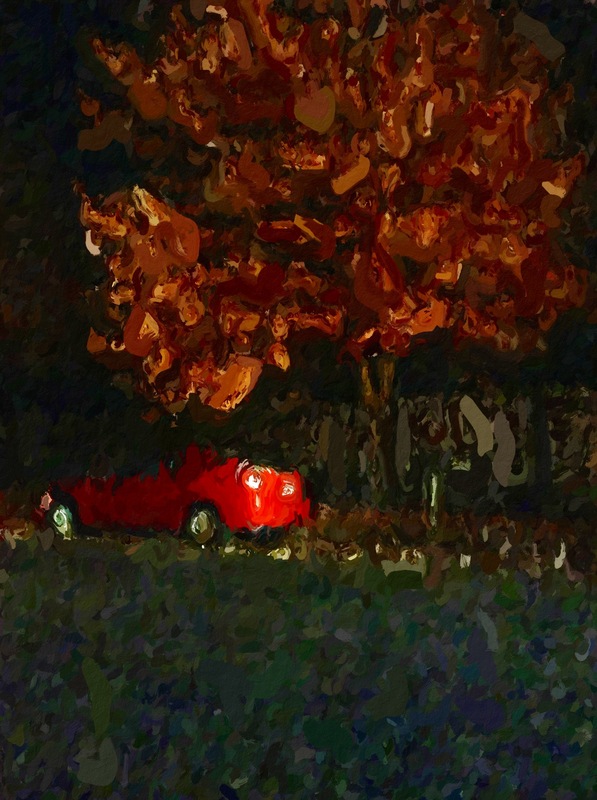 My car was right where I left it – next to the cemetery and covered with fallen leaves – I bet the tree was laughing at me all day. 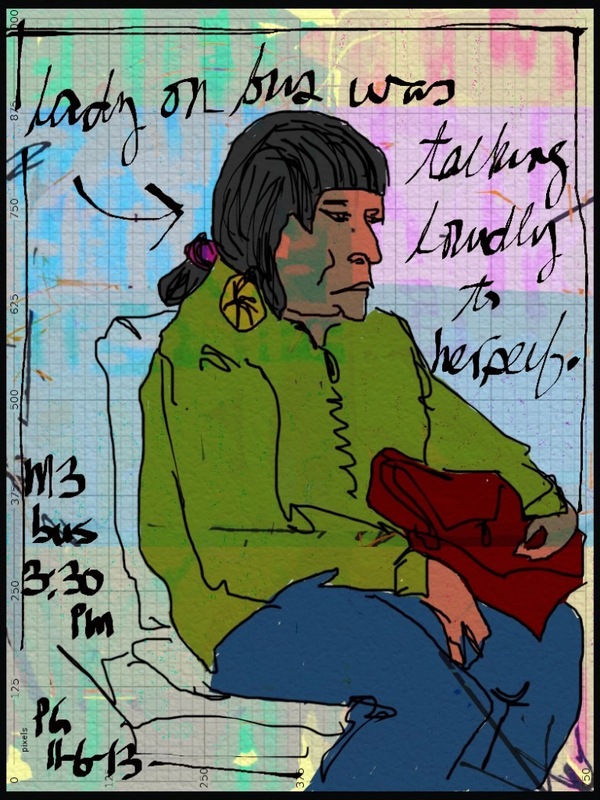 iPad; Apps: Sketch Block for drawings and color; Sketch Club for statue text and fooling around with the bus lady; ArtRage for painting the statue with oil paint and seriously farting around with the bus lady background, etc. I don’t even remember what “etc.” consisted of. The statue was really a very ancient gray/faded ochre kind of color that I didn’t even attempt to duplicate. Photo of car: iPod Touch, mailed to the iPad. Glaze app used on it.